Title tags had a maximum length of 55-60 characters before becoming truncated with an ellipsis in Google’s search results. In 2016 however, this character limit was increased to 70 characters. 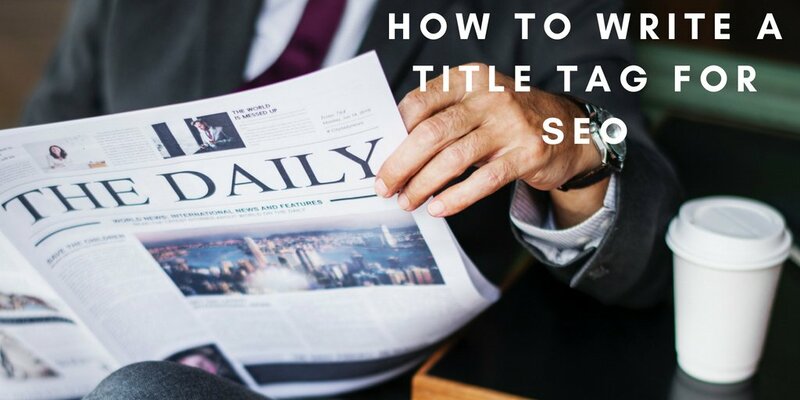 When thinking about the importance of title tags, there are two primary factors to consider: search engine bots and humans. For search engine bots, title tags are used as a ranking factor in Google’s algorithm. In other words, title tags influence the keywords Google bots associate with your website. If your title tags aren’t optimized for search engine bots, you could be missing out on an opportunity to improve your keyword rankings. For humans, title tags are essentially a headline. They play a major role in enticing people to click through to your website when seeing your listing in Google’s search results. If your title tags aren’t written in a way where they entice people to click on your links, you could be missing out on an opportunity to bring more traffic to your website. Since Google’s bots use title tags as a signal for which keywords to associate with your website, use your web page’s target keyword(s) in your title tag. However, you should exercise caution in over-using keywords in your title tags. You don’t want to “keyword stuff” your title tags such that they don’t make sense. This somewhat speaks to a larger issue – when thinking about a keyword targeting strategy from a more general perspective, you should limit the types of keywords you optimize each page for. For example, if you have a home improvement company, and you have one service page covering all of your offerings – window installation, exterior renovations, bathroom remodeling, etc… – you will end up diluting your keyword focus such that your one large service page will be unlikely to rank for any keywords. Instead, if you were to publish individual pages tailored to each of your unique service offerings, each of those pages will have a clear keyword focus with a better chance of ranking for their designated keyword(s). Sometimes it makes sense to target multiple keywords per page, but only if they are closely related. The keywords, “Internet Marketing Company,” and “Digital Advertising Agency” are good examples of keywords that are so closely related, it makes sense to target both on the same page. Coming back to title tags, if you want to use more than one keyword in a title tag, be sure they are closely related. As mentioned previously, the character limit for title tags has been increased to 70 characters. If your title tags are too long, they will be truncated in Google’s search results with an ellipsis. You could be missing an opportunity for users to read a full title tag which would compel them to click on your links. On the other hand, utilize as much as space as you can in your title tags. A short title tag could be a missed opportunity to give users a reason to click on your links. Sometimes, writing a title tag that only includes your keywords can result in boring, bland copy. When thinking about writing title tags for humans, you should approach a title tag the same way media organizations approach an article headline. Your targeted keywords do not need to appear verbatim in a title tag. Using keywords naturally in a title tag as part of a compelling headline is the best way to optimize for both search engine bots and humans. This title tag is 39 characters long, which leaves us 31 extra characters to use. Our keyword appears in this title tag, which is good. We also have a pipe separating our keyword and brand, which is also good. Google bots view pipes and dashes as “keyword separators.” Essentially, we’re telling Google that “Title Tag Best Practices,” and, “SoMe Connect” are to be viewed as two separate keywords by using the pipe in this way. It’s also good that we have our keyword appearing as the first phrase in this title tag. Google’s bots place a heavier weight on the first text they read, so we’re sending a strong signal to the bots with this title tag. However, few people are likely to find this headline very interesting. And since the Google bots take user engagement into consideration, keyword rankings could be withheld from us if few people click on our link – even though we’re optimizing for the Google bots here. This title tag is 69 characters long, utilizing almost all of the space we can use. Our target keyword does not appear verbatim in this title tag, but that’s okay. Google’s algorithm is sophisticated enough to pick up on “Title Tag Best Practices,” in this string of text. The keyword appears toward the end of the title tag, which could result in the bots giving less weight to the keyword. Not ideal, but acceptable in this case since we’re really writing this title tag with the intention of being an interesting and compelling headline. As a general rule of thumb, if you ever run into an SEO issue where you can either optimize for the search engine bots or humans, always optimize for humans. Search engine bots are always being refined to behave more like humans, and they currently place a heavy weight on your website’s level of engagement as a ranking factor. Why is Google Not Using my Title Tag? One final note – a title tag is a suggestion of what to display in for your web page in search engine results. We are at the mercy of Google’s AI at the end of the day, and that AI may choose to use a different title tag. Sometimes it’s merely a matter of the time it takes for your website’s listing in Google to reflect an update you made to your title tag, but other times, Google will simply choose to display a different title tag based on a search query. In this instance, the Google bots think this title tag is more relevant to the search query and display their results accordingly.